Starting with a 7:30 AM wake-up call (much too early for our liking), we explored the religious sites around Durham, including authentic cold, rainy Scottish weather. We first went to Durham Cathedral, built by the French in the 11th century. With stone ceilings, intricate pillars and flying buttresses, the Cathedral was a testament to the dedication and skill of those working for the glory of God. A main purpose of the 40 year construction of the cathedral was in housing the remains of Saint Cuthbert, who died in the 7th century. Interestingly enough, during the Restoration when all religious artifacts were being thrown out and destroyed, monks, attempting to throw away the bones of Cuthbert, were met with a corpse of Cuthbert completely intact, an idea which suggests divine intervention. We then went to eat lunch by the river outside the Cathedral, enjoying an authentic British lunch such as prawn and mayonnaise sandwiches. From there, we went to the Durham Castle, part of Durham University, with chapels, beautiful architecture, and impressive relics and artifacts. Having gone through a tour and standing in the site of the Grey Lady, the ghost of a set of black stairs within the castle, we broke up into our small groups and had time to wander through the winding streets of the city. Anna went to the British version of Walgreens, purchasing very moisturizing lip balm (A+ 10/10), and Charlie and his group went to a Cafédral Durham (he found the name particularly funny), and enjoyed hot chocolates. The next step was lectio divina within the small groups, in which we studied a passage and picked out a word from the passage and related it to our lives. 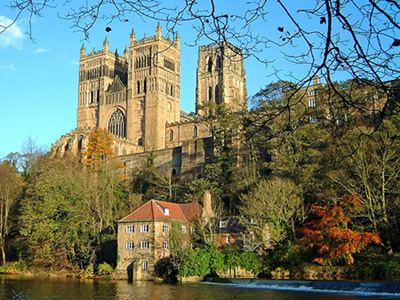 Charlie and his group sat on a path next to the Durham River while Anna’s went to the café in the Durham Cathedral to talk about Isaiah 6:1-8. During this small group reflection, we focused on God’s unending forgiveness despite the fact that we are inherently impure and unworthy.